An enduring mystery of home maintenance is what prompts one to suddenly attend to something that had long been ably ignored. It took four months of winterish weather for me to finally wonder why I hadn't heard the pump periodically cycle on down in the basement. It's not a sump pump, but instead a small water pump that's part of a humidifier designed to feed moisture into the warm air that comes from the furnace. I had inexplicably neglected to open the vent that sends air into the humidifier to get humidified. Thus, dry air all winter. Perhaps this is one of the unsung benefits of the arts, that they reinvigorate long dormant pathways in the brain, and give one the courage, or at least the presence of mind, to wander down into the basement and discover what should have been done four months earlier. For more on Victor Hugo's views on the sewers of Paris, spoken through the character Jean Valjean, this Mount Holyoke website catches some of it. Hugo "saw the sewers of Paris as the "conscience of the city" and "lamented what he saw as a waste of valuable resources in the sewers; he advocated the use of sewage as fertilizer." Princeton spends upwards of half a million dollars each year on natural gas to incinerate the nutrients in its sewage and send them off to a landfill. The musical about the people of Princeton rising up to end this tragic squandering of resources has yet to be written, the composer being currently preoccupied with getting his furnace humidifier to work before it's time to turn it off in the spring. How to Harness A Passion for Scrap? Juxtaposed with our pell-mell consumerism (large amounts of trash generated each week, cars burning gas like there's no tomorrow) are periodic demonstrations of a passion for recycling. This abandoned television offered a good example recently. It's common, though not legal, to put televisions out on the curb with the trash. Sometimes the trash collectors take them, sometimes they observe the law and leave them on the curb. Sometimes I haul these things back to my carport and take them en masse to the recycling day, but haven't gotten around to it lately. A few days after this particular TV was put out, I saw a guy taking it apart and pulling out the electronics. "What for," I asked. For the copper, he replied, which he said is worth $3/pound. He claimed there was a pound of copper in there, but it felt like less to me. He carried it back to his SUV around the corner. All that work for $3? At least what he was doing was quasi-legal, in contrast to the scrap thieves who break into buildings--even new ones that have yet to be sold--and yank out all the wiring, causing tens of thousands of dollars of damage just to get $100 of copper. Nothing seems to be sacred, not even the railings on the front steps of churches in Trenton. At the same time, given how little payback is required to motivate this frenzy of scrap collection, couldn't this sort of energy be harnessed to improve all the dysfunctional recycling programs in buildings across the town, state and country? Surely some small incentive could be instituted to motivate custodians to put recyclables in the right bin out back, rather than dumping it all in the trash, as so often happens. If you ask people in charge why they don't incentivise custodians to do the right thing, they'll say that custodians should simply do what they're supposed to do. But many of them don't, and they have a good excuse. People tend to obliviously throw trash in the recycling bins, particularly if the bins are poorly designed or not paired with trash cans. Custodians will simply point to the contamination as reason to throw everything away. With a little incentive, they could become the advocates for recycling that buildings otherwise lack. One thing we were told, while touring the sorting plant in New Brunswick where Princeton's recyclables are taken, is that wet paper tends to fall out of the sorting machinery and end up being taken to the landfill rather than get recycled. Weight being one of the factors that helps separate recyclable at the sorting plant, the heaviness of wet paper can prevent it from getting shunted onto the right conveyor belt with all the rest of the paper. Most recycling programs avoid the problem of wet paper by providing residents with amply sized rollout bins with attached lids. Rollout bins also have wheels so residents don't have to do heavy lifting to get their recyclables to the curb. Until Mercer County provides us with proper containers for our recyclables, residents can help by covering their yellow and green "buckets" one way or another. This will also reduce mosquito reproduction in the summer, when small amounts of water in a tin can or bottle are enough for the imported tiger mosquitoes to start a new generation. Abandoned swimming pools, like this one that has stood empty in a Princeton backyard for years, are a sad sight. What to do with them? Surprisingly, these symbols of high-maintenance leisure are at the forefront of a grow-your-own movement out west. The following is a post on islands of sustainability in the super-heated urban world of Arizona. The last few paragraphs describe a clever adaptation of swimming pools. My nephew in Arizona always has interesting news about homesteading out west. Raised in a house with a wood stove in Vermont, his career took him away from the warm fire and into the frying pan of Phoenix, where he and his wife are raising three kids, along with chickens and rabbits--all on what sounds like a small residential lot. The chickens and rabbits play the role they once played on a farm, offering a way to sustain a family and do right by the planet. He says he likes to run nutrients through as many steps as possible before they exit his property. For instance, chicken feed and kitchen scraps become chicken manure, which fertilizes the garden, which feeds the rabbits. At each step along the way, some sort of food heads for the kitchen, be it eggs, garden vegetables, or rabbit meat. The ladies, as he calls the hens, provide sufficient eggs for breakfast omelets and a weekly dose of egg salad. A periodic batch of male chickens, raised from chicks, end up in the freezer. The coop can be partitioned into two, to keep the males and hens separate. Otherwise, the nine hens have the whole coop to themselves. It sounds like a lot of work, adding a layer of animal care and periodic feather plucking sessions on top of all the effort involved in raising three young kids and making a living. But they are essentially applying to everyday living the can-do spirit that in mainstream society only surfaces briefly during crises. People become heroic, community-minded and resourceful in the wake of (un)natural disasters like Hurricane Sandy, then quickly return to a status quo in which any mention of sacrifice or inconvenience is dismissed with a groan. Meanwhile, the status quo is brewing ever larger and more frequent disasters in the future. By using our formidable capacity to adapt and prevail only during emergencies, we miss the opportunity to adjust our lifestyles in ways that would steer us clear of a dystopian (new word in my vocabulary) future. One positive thing about sacrifice is that one can get good at it, until it hardly seems sacrificial. Phoenix, actually, is already living in a super-heated dystopian future. Summer temperatures average 100 degrees. Though temperatures may drop 60 degrees at night in the countryside, city dwellers are denied that relief. Because of the heat-island effect, where asphalt and buildings absorb the day's heat and slowly release it through the night, urban nights can remain in the 90s. Opposite of the north woods, cabin fever strikes towards the end of summer. Only in winter do people venture outside for extended periods. How the chickens can survive the heat is something I'll need to ask next time. The importance of night-time temperatures will become increasingly noticeable in New Jersey as summer temperatures rise. Attic fans have been one low-energy way to keep a house cool, by blowing the day's accumulation of hot air out of the house and pulling the cool evening air in. As summers get warmer and areas of unshaded pavement expand, the cool evenings and the relief they bring will become increasingly rare. Natural cooling augmented with an attic fan will become less of an option, making people even more dependent on energy-guzzling air conditioners. In Phoenix, swimming pools are common, while solar panels are rare--the opposite of what you'd expect in a desert. Such is our upside down world, where obvious problems are maintained while obvious solutions are shunned. Part of the reason why solar panels are rare may have to do with Phoenix not being a very comfortable place to live. More transience means less long-term investment in one's home, which means people are reluctant to sign a 20 year lease on solar panels, knowing they'll have to then find a buyer willing to assume the lease. Some people, feeling a bit guilty about having a swimming pool fed by unsustainable water supplies, have begun converting them into highly productive habitats to grow food. A chicken coop is suspended over the pool. The droppings fall into the half-filled pool, stimulating growth of duckweed, algae and other plants, which in turn are fed on by tilapia. The water, which would otherwise get fouled with excess nutrients, is then pumped through a hydroponic garden where plants extract nutrients. Solar panels power the irrigation system. There's info about these systems on the web, including this post and video, produced with some support from Whole Foods Market. Closer to home, a similar approach is used by Will Allen and his GrowingPower group in Milwaukee. Will has visited Princeton a couple times to give presentations. My nephew hasn't converted his swimming pool yet. There's a difference between having a chicken coop in a corner, and converting one's whole backyard into a minifarm. Still, this pushing of the sustainability envelope suggests there's hope for abandoned swimming pools after all. The 2013 Princeton Environmental Film Festival ends this weekend. Check out the films at the link. As part of tomorrow's programming, at 11am Sunday, Feb. 10 at the Princeton Public Library, I'll give my presentation on the legacy of Princeton visionary Oswald Veblen and the 1920 prefab house, 1870 farm cottage, and 95 acres of Herrontown Woods nature preserve he and his wife, Elizabeth, left to Mercer County. More info at VeblenHouse.org. A year ago, after considerable lobbying by our 12 year old daughter, considerable internet research, and running it by the neighbors, we finally bought some chicks at Rosedale Mills in Pennington. They now live in a backyard coop--basically an existing structure that we modified--and have turned out to be enjoyable "pets with benefits." I've begun to write about the experience at a parallel blog to this one, PrincetonNatureNotes.org. A recent post on research into Princeton's poultry policy can be found at this link. Other related posts thus far are "To walk a duck" and "The year of the chicken." One thing that light snowfalls are good for, other than brightening the day by recycling light, is to find out where your attic needs more insulation. If the roof remains white long after the snow, it suggests that the insulation is uniform and thick. A quick melting compared to neighbors' houses suggests a lot of heat is getting lost through the ceiling of the top floor either through poorly designed recessed lighting fixtures or inadequate insulation (a steep roof can also affect how long snow remains). The melt pattern in this photo is from my own roof. There are two small spots where the snow is melting faster. The bigger one coincides with where a heat vent is close to the ceiling in the bathroom. Adding more insulation to that spot is tricky, because one has to squeeze in close to the rafters in the attic, and be sure not to stuff insulation so far in that it touches the roof boards and cuts off airflow needed to keep the boards dry. A 2008 post on this subject offers more melt patterns, and has a useful comment by a reader about the problem with recessed lighting. One seemingly bottomless source of national pessimism is the notion that government can't do anything right and that regulators are by nature the enemy of freedom and commerce. This pessimism, with deep ideological roots, is a core impediment to action on climate change. President Obama took a different view in his inauguration speech, saying we've learned from the nation's history that "a free market only thrives when there are rules to ensure competition and fair play." 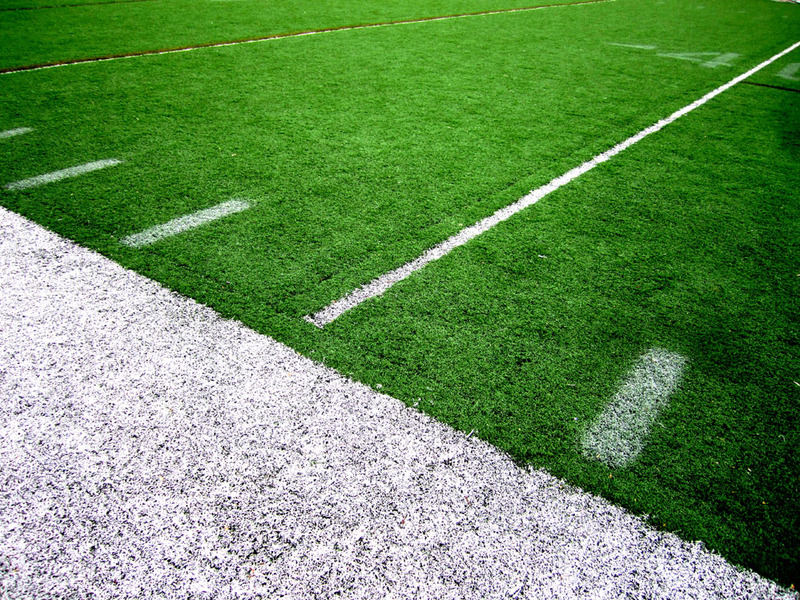 Today's Super Bowl will confirm this view, as players in a thriving NFL demonstrate that immersion in a closely regulated playfield environment is no impediment to high performance, spirit and invention. Sports in general provides a fine analogy for what government's role should ideally be. The athletes and their teams, motivated to beat the competition, bring to their game the same energy and creativity that entrepreneurs and businesses bring to the marketplace. 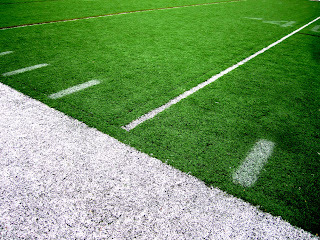 But though the players and coaches may dispute a call now and then, they don't make the mistake of perceiving regulation as the enemy. Rather, a good game requires clear rules and regulations that are fairly applied. Boundaries in sports do not constrict action so much as channel it, challenging the players to refine their skills to make the most of the freedom and opportunities the game's framework provides. Without a net and clear boundaries, tennis would never have produced the likes of a Federer or Djokovic. Similarly, manufacturers have responded to the combination of a competitive marketplace and rigorous government standards by greatly increasing the efficiency of appliances like refrigerators, while also lowering costs. Environmental regulations, then, are falsely maligned when in fact they can motivate manufacturers to dramatically improve their products and save consumers money. There must be many football fans who believe that the nation's economy would thrive if only government regulations were slashed, and yet the game itself is a celebration of rules and regulations. While underregulated financial institutions were precipitating a financial meltdown in the fall of 2007, football fans were scrutinizing instant replays for the slightest infraction. This past fall, professional football provided a definitive demonstration of what happens when governance is given short shrift. When the NFL replaced its union referees with high school and college refs used to slower-paced play, their incompetence damaged the game. The NFL essentially replicated an experiment conducted by George W. Bush. By putting incompetent appointees in charge of FEMA, President Bush set the stage for the botched government response to the devastation in New Orleans following Hurricane Katrina. Green Bay Packer quarterback Aaron Rogers got it right when he said that top notch play and officiating are complementary, not antagonistic. A high standard of play on the field must be "complemented by an appropriate set of officials." Sports, too, clearly demonstrates the flaw in the assertion that regulations would better be determined by states rather than by the federal government. Imagine if teams in different states could make up their own rules and field dimensions. The result would be chaos, which is why industry so often lobbies for uniform standards at the federal level. Ideologies that equate regulation with tyranny, common in political discourse, sound bizarre when applied to the realm of sports. You don't hear athletes quoting Ayn Rand and calling for the elimination of referees and boundaries in the name of freedom. Nor is there any illusion that professional athletes will nobly police their own behavior. As football has increased in speed and complexity, the NFL has increased the number of referees from 3 to 7. Contrast this with calls by many politicians to get government out of the way of financial markets, even as the financial sector has exploded in size, complexity and speed. But the importance of regulation and its consistent enforcement goes beyond insuring an exciting, fair, well-paced competition, whether in sports or the marketplace. Particularly in football, good regulation also protects players from mutual destruction. It is understood that each player is potentially a lethal weapon, capable of harming self and others. In some ways, chronic traumatic encephalopathy--the longterm consequence of repeated concussion--is to football what climate change is to a fossil fuel-based economy. Both maladies are slow to manifest, eventually making normal life impossible. How does one save football, when the violence it is based on puts players' brains at risk? And how to save our economy, when the fuels it is based on put the nation at ever-increasing risk of catastrophic changes in weather patterns? Here, again, the sports world has proven more mature and reality-based than the political realm. As scientific evidence of the long-term impact of concussions has accumulated, denial has given way to regulatory efforts to grapple with the problem. As in the marketplace, the goal in football is not to rid the game of regulations, but to find the right balance. Too much regulation stifles creativity and slows the action. Too little breeds chaos and puts the players and the game itself at risk. When well-targeted regulations are consistently applied, governance disappears into the background and all attention can be focused on the game. It is this aspect of the anti-government movement in our national political discourse that is most corrosive of the nation's functioning and spirit. The constant questioning of government's legitimate role in regulating society has the paradoxical effect of keeping government in the foreground, a bleeding sore that will not heal. We need to get past this constant berating of government, acknowledge its vital role, and work to refine its implementation so that it can hum along smoothly in the background. Referees and regulators will never be loved. But there can be no doubt they are vital to the game. It's time such an understanding spreads to our political discourse. (Also posted at VeblenHouse.org) Coincident with my upcoming presentation on the Veblens and the Veblen House, at the Princeton Environmental Film Festival on Sunday, Feb. 10 at 11am, the archive room at the Institute for Advanced Study is currently hosting an exhibit on mathematician and visionary Oswald Veblen. There is, according to past director of the Institute, Peter Goddard, an increasing appreciation of Veblen's legacy. Most people associate the Veblen name with Oswald's uncle Thorstein, the famous economist and social critic, who coined the phrase "conspicuous consumption". Mathematicians are aware of the Oswald Veblen Prize in geometry, awarded every three years. There is, however, no prominent book, phrase, building or nature preserve that bear's Oswald Veblen's name, and yet his influence and vision left a lasting mark in Princeton and beyond, across a broad range of pursuits. One of the documents on display provides a succinct summary. Veblen brought to Princeton elements of his bucolic midwest upbringing and his family's European roots, made manifest in his efforts to consolidate land for Herrontown Woods and the Institute Woods, and his influence in improving U.S. academic standards to better compete with European universities dominant at the time. Nature for him was a place for both physical work and intellectual contemplation. His environmental interest was both outdoor and indoor--preserving forests while also designing innovative interior spaces such as Old Fine Hall (now Jones Hall) that set a new precedent for mathematical accommodations and later served as an initial base for the Institute. From the exhibit's materials: "With a passion for the outdoors and physical labor, Veblen often brought colleagues with him on trips to the forest to chop wood and was very involved in the construction of the Veblens' Princeton residences on Battle Road and in Herrontown Woods." The Veblen House in Herrontown Woods reflects these twin legacies, with its European touches and bucolic setting. The influence of mathematicians on those who follow is actually tracked and, not surprisingly, quantified. As stated in the exhibit, "The Mathematics Genealogy Project credits Veblen with 8,495 descendants, a number that is especially impressive given that he served as the formal advisor to very few students after he moved to the Institute in 1932." In another quote from the exhibit, "Essentially all of the (Institute's) early School of Mathematics Faculty--Albert Einstein, Hermann Weyl, James Alexander, von Neumann, Marston Morse -- derived from suggestions from Veblen. The exhibit at the Institute continues at least through mid-April. Water is a miraculous molecule. With earth as its perfect playground, it can shift with ease from gas to liquid to solid--a feat not replicated by any other molecule I know of. The movie, Chasing Ice, which played last night at the Princeton Environmental Film Festival and will repeat tonight (Saturday, Feb. 2) at 7pm, shows water's dazzling manifestations in the solid realm--an increasingly endangered state as human-caused global warming sends glaciers and ice caps into rapid retreat. National Geographic photographer James Balog leads an expedition to mount time-lapse cameras on mountainsides overlooking some of the earth's remaining glaciers to track their decline. 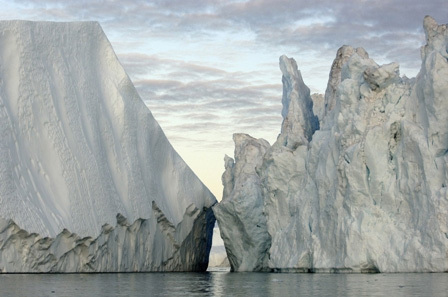 Reaching remote locations to take such dazzling photos takes a toll on Balog's knees, a theme that parallels the radical destruction of glaciers worldwide throughout the movie. Whether it's Balog abusing his knees yet again after three surgeries, or humanity abusing the planet, clear evidence of a problem doesn't prompt any change in behavior. We're glad he persists, though, because the resulting images capture a compelling mixture of beauty and environmental travesty. His willingness to sacrifice can be seen as a comment on humanity's dilemma--either we willingly sacrifice now by greatly reducing energy use, or we are forced to sacrifice later as a radicalized climate increasingly destabilizes nature and civilization. Equally impressive in the film are the interludes in which data pointing to our profound impact on the planet is presented in a manner more effective than any I've ever seen before. 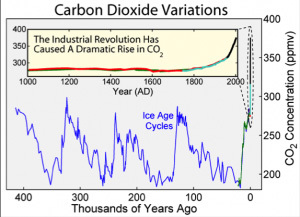 The graph at the left, from Skeptical Science and also on the ChasingIce website, is eye-opening even in this prosaic form, but is presented in the film in a dynamic three-dimension format that should be seen by every person on the planet. I wish the filmmakers would release those educational snippets as short videos for widespread public consumption. Glaciologist Olga Sergienko fielded questions afterwards, and will be back tonight.